For me, the highlight of the 2009 Fells Point Festival was seeing the Globe Poster Company table outside of BOP Pizza. What a great idea – and long overdue! 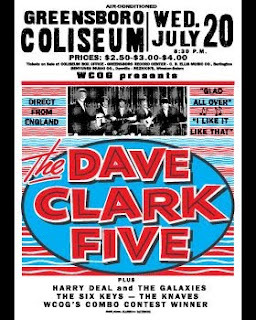 For those not in the know, Globe Poster Printing Corporation is the legendary Baltimore poster company best known for its colorful boxing-style concert posters promoting the top R&B, Blues, and Rock & Roll touring acts of the 50’s, 60’s and 70’s. “Vibrant!…gorgeous, fabulous! !” doesn’t begin to describe the flashy boxing style posters produced by Globe Poster Printing Company. You’ve probably seen their handiwork stapled to a telephone pole or plastered on a wall around town and not even known it. Full of flashy neon-bright colors and distinctive wood-block typography, Globe Posters are as much a part of Baltimore’s pop culural heritage as psychedelic posters were to San Francisco in the ’60s. 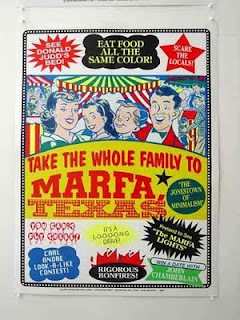 Heck, no less a Baltimore icon than John Waters acknowledged Globe’s influence when he designed his Summer 2004 Artforum cover – celebrating the wonders of Marfa, Texas (a town best known for the “Marfa Lights” and as a film locale for George Stevens’ Giant, the Coen Brothers’ No Country For Old Men, and Paul Thomas Anderson’s There Will Be Blood) – at the Highlandtown poster shop in the signature Globe style. 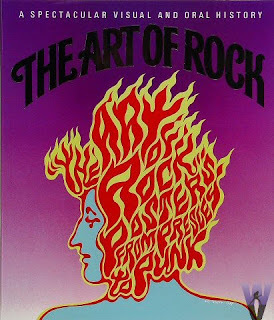 Globe posters have been featured in The Art of Rock (an Abbeville Press coffee table book) and Rolling Stone magazine and are also in collections at Cooper-Hewitt, the Rock and Roll Hall of Fame, and the Stax Museum of American Soul Music. The Creative Alliance mounted an exhibition of Globe’s work 10 years ago and another exhibition of Globe poster art is currently on display at the University of Baltimore‘s Student Center Gallery. (Speaking of the Creative Alliance, they were clearly influenced by the Globe exhibition; I still have the Globe-style poster they used a few years ago to promote their silent film-with-live orchestra series, which featured Anne Watts and Boister orchestrating Buster Keaton’s Seven Chances and Garbo and John Gilbert’s romance in Love.) A few years back, Baltimore’s Theater Project commissioned Globe to create posters advertising their season’s repetoire. More recently, Chris Landers wrote an excellent profile (“Letter Men“) of Globe Poster in the February 4, 2009 issue of the Baltimore City Paper. Norman Shapiro purchased Globe in 1955, but for the past 35 years the 80-year-old Highlandtown company has been run by the Cicero family of Joe Sr., Joe Jr., Frank and Bob. Joe Cicero, Sr. died last year at age 91 and Joe, Jr. retired a few years ago, leaving brothers Frank and Bob to run the show. And there they were, manning the colorful Globe Poster booth at the foot of Broadway and Thames Streets. Amy and I stopped by to say hi. Amy works with a woman whose nephew married one of the Cicero children, so she mentioned the Smalltimore connection. I had met the brothers years before when researching a film (folly) idea. You see, years ago at the “height” (was there ever one?) 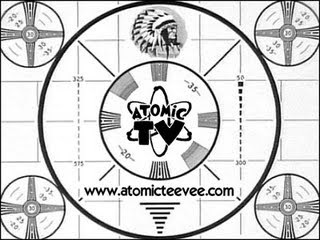 of producing my public access show Atomic TV, I toyed with the idea of doing a documentary about the Globe Poster Company (alas, like many thoughts buzzing around that beehive that is my mind, it quickly disappeared). Then I ran into Baltimore magazine music writer John Lewis one day at Daedalus Books & Music in Belvedere Square and, looking at a rock posters book, got to talking about Globe Poster. When I mentioned how I thought somebody should do a documentary about Globe Poster, John said he had already started one along with architect/arts impressario Alex Castro. I was elated, as John Lewis is probably the foremost expert on Globe Poster (writing perhaps the definitive profile of the company years ago for Baltimore mag or City Paper, I forget which; he’s also a great friend of the Cicero family, having penned Joe Sr.’s obit for Baltimore magazine) and Alex Castro has already tested his mettle in the local filmmaking field with his National Bohemian doc Mr. Boh’s Brewery (which he co-directed and produced with Harry Connelly and Lyle Hein). Lewis and Castro have already interviewed fans such John Waters, Solomon Burke, and Rosa Pryor, and have plentiful footage of the Cicero clan. Frank and Bob Cicero were particularly pleased that the filmmakers were able to get their father on camera before his passing last September. This one’s for you, Jimi Hendrix Man! Even an Iranian painter who had a booth near the beer garden stopped me and asked, “Is that Jimi Hendrix? He is genius!” – imagine, a Middle Eastern woman recognizing a Western pop music icon just as readily as we would see a picture of Buddha, Mohammed, or Krishna and instantly know its importance in the annals of world religions. Hendrix’s legacy carries that kind of clout. When I told people where I got the poster, they’d reminisce about their connection to either the concert venues advertised or Globe Poster itself. One guy said he used to have a job stapling the posters to telephone poles around town and, looking at my “Miles Davis at Godfrey’s Famous Ballroom” poster, fondly remembered the Famous Ballroom (which used to occupy the second floor of what is now the Everyman Theater in the 700 block of N. Charles Street) and another long-gone jazz club around the corner from it on Lafayette Street. So popular was I walking around the fest with my Globe posters, that I went back down on Sunday afternoon to get some more. 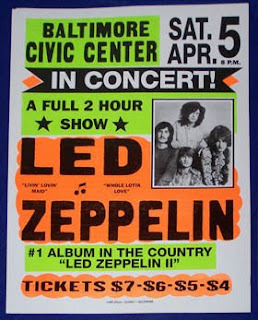 Right away I spotted a new arrival, this beautiful Led Zeppelin poster hawking their April 5, 1970 appearance at the Baltimore Civic Center (now the 1st Mariner Arena) in support of Led Zeppelin II. the cost of a Starbucks venti latte! According to ledzeppelin.com, Led Zeppelin played three times at the Baltimore Civic Center: April 5, 1970; June 11, 1972; and July 23, 1973. 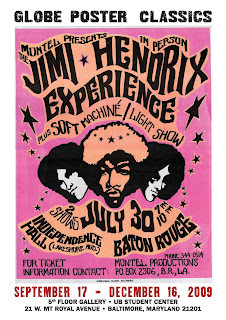 The top ticket price for the 1970 show was…$7.50! 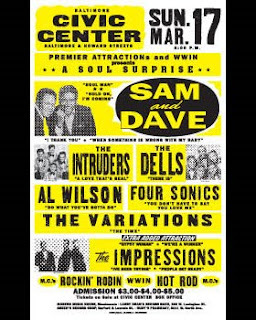 Note the mention of WWIN DJs “Rockin’ Robin” (Fred Robinson, whose theme song was Bobby Day’s 1958 hit single – and who besides being a DJ was a licensed barber and whose company Premiere Attractions brought many national recording acts to the Civic Center) and Maurice “Hot Rod” Hulbert at the bottom of the poster. 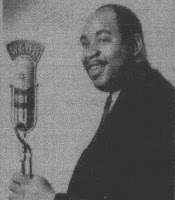 “Hot Rod” was the only Baltimore DJ to be enshrined in the National Rock n’ Roll Hall of Fame in Cleveland and, according to ultimateoldiesradio.com, he had a saying “VOSA” which meant “Voice of Sound Advice.” Another Hot Rod catchphrase was “Great Googa Mooga” (which the Temptations used in their hit “Ball of Confusion”). 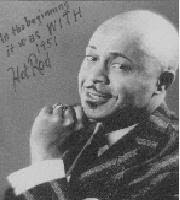 Hot Rod’s showmanship appealed to both black and white audiences at venues like Carr’s Beach in Annapolis and the Royal Theatre and The Coliseum in Baltimore. Listen to a 1954 soundcheck here. Sadly, both Rockin’ Robin and Hot Rod passed away in 1996. 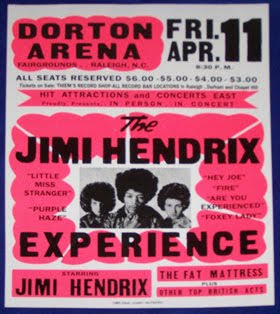 But back to Led Zep…Jimmy Page had played Baltimore before – as a member of The Yardbirds in 1966, a fact I learned after seeing this poster on the Globe Poster web site. I gotta track this one down! 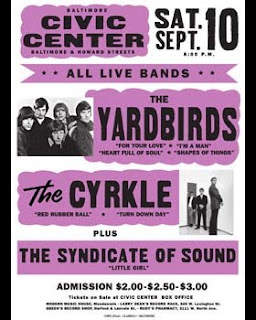 Great supporting acts too, with The Cyrkle (“Red Rubber Ball” – Billboard #2 in 1966) and garage rockers The Syndicate of Sound (their single “Little Girl” reached as high as #8 on the 1966 Billboard charts and was later covered by The Dead Boys and The Divinyls). 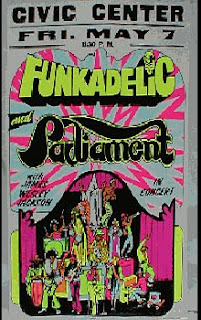 The 1966 U.S. Tour even included a performance at a Roller Rink (anticipating a later joke in Spinal Tap) in Alexandria, Virginia! (Can you imagine being at that show?) For some reason, Baltimore had clout in those days, with two dates slated for the Civic Center on September 11 and 12, but the latter date was cancelled due to poor ticket sales. After I drooled over these posters and commented on how beautiful they were, Bob Cicero mentioned that the current exhibit at the University of Baltimore’s Student Center Gallery is “Globe Poster Classics,” a collection of works from the legendary Globe Poster Co. of Baltimore – works that the U of B rightly considers classic examples of 20th Century American Pop Art (after all, some of these prints sell at auction for hundreds and in some cases thousands of dollars). Using the original letterpresses, inks, and 24 weight card stock, the posters seen in this exhibit faithfully replicate the original works. The collection will be on display through Dec. 16. 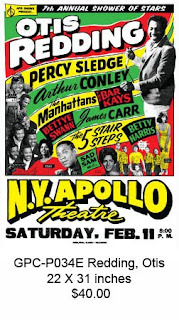 As I marveled again about the art behind Globe Posters, I recalled how City Paper writer Chris Landers used an Otis Redding at the Apollo poster to demonstrate the style for which Globe is known, one in which each listed act gets its own space on the poster. It’s a great plan, guys. Keep it up! This entry was posted in Uncategorized and tagged civic center, globe poster, hot rod, rockin' ribin, rockin' robin, wwin. Bookmark the permalink. 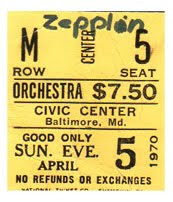 The information that Led Zeppelin only played three times at the Baltimore Civic Center is incorrect. Premier Attractions booked our local band “Lemon Lime” to open for Led Zepplin and the headliner Vanella Fudge in February 1969. I use to have the poster but it was stolen thirty years ago. If anyone has a copy please let me know. I’m a high school friend of the Heibergers. I have a small version of the poster from the February show in jpeg format if you send me your e-mail address. I was backstage with you. Also Blind Faith and Spirit/Iron Butterfly in 69. Odd that the Fudge/Zeppelin show didn’t show on ANY record of either band for decades and people told me I was crazy that I was there. I’m trying to find a poster from 1953thru 1955 of a Baltimore group named the Magic tones you have one would you please contact me. My husband is the last member of the group that is still living. Please let me know. Where can I find some of these reproductions for sale? I used to have a ton of them while in high school and college, but lost them all in a house fire. I would love to get some of those old go go posters again. Thanks for any info. If anyone is looking for Globe Poster Classics concert posters. They can be purchased at http://www.europosters.net Check it out. Thank-you! Are Globe Printing 50’s & 60’s Posters available for purchase and if so how? I am looking for Rare Essence globe posters. Who has them?